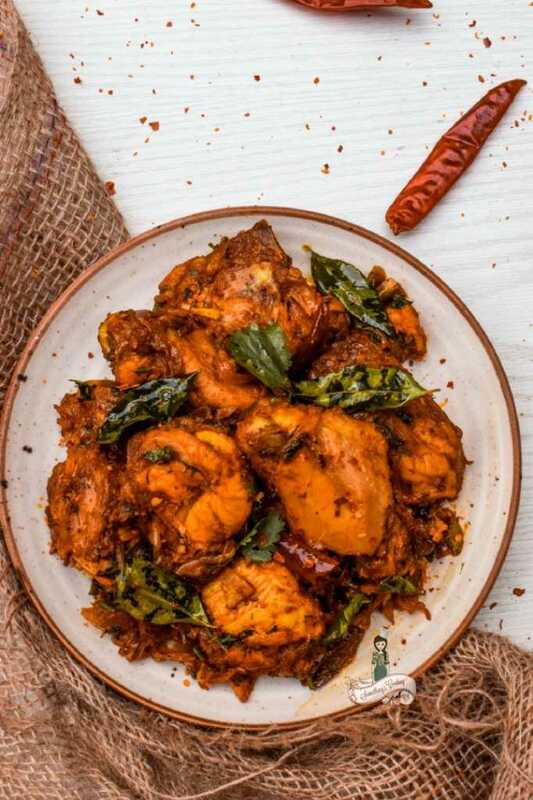 Chicken Peralan is a Kerala style spicy, delicious dish where the chicken is marinated in a rich blend of spices. It is then roasted and cooked with fried onions. Regional cuisine has its own charm. 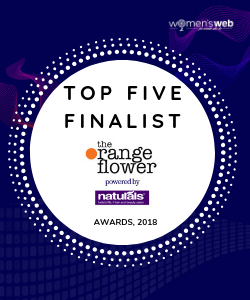 They are reassuring and comforting and given the diversity of Indian culture, it will take you forever to get a sense of the many traditional recipes. 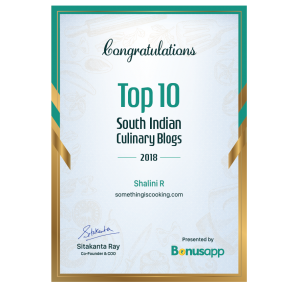 It’s heartening to find that the new generation is keen on discovering regional cuisine and how far it has come from its roots. Yes, regional and less explored cuisines taking our world by a storm. Each day I thank the Heavens for providing me with this opportunity to travel the country and relish the less explored. Being an Army Wife, I get to discover the nooks and corners of India, be it in the form of food, places or culture. As a food blogger, I try my best to bring to you these hidden gems. Remember Bhatt ki Dal and Aloo ke Gutke from Kumaoni cuisine of Uttarakhand which I shared a few weeks ago? These lesser-known foods are legendary often for its simplicity and unique flavor combinations. Kumaoni cuisine focuses on ingredients that are high in energy and nutrition. Today, I am here with a delicious recipe from Kerala. The state is known as ‘God’s own country‘ and I can only imagine why. Of course, the lush greenery, backwaters, lagoons, houseboats, rains, mountains, hill stations, paddy fields, coconut trees are all reasons enough. However, I would say, as a true blue Malayalee, your trip to Kerala isn’t complete until you taste the mouth-watering dishes this little state has to offer. From Appams to Ishtews, Payasams to Thorans, Cutlets to Ethakkappam, Biriyanis to Fish Curries, Kerala cuisine is to die for. 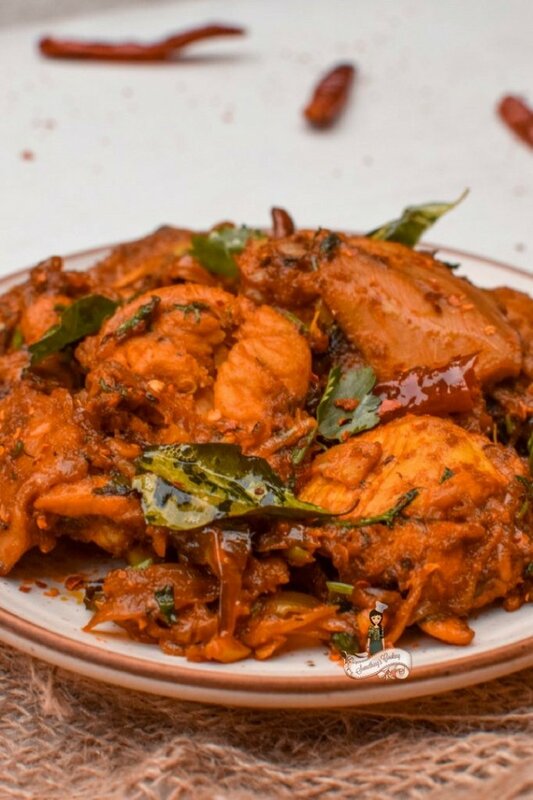 Chicken Peralan is a type of traditional chicken roast and is a constant feature during our Sunday lunch. A great side dish with appam, rice, biriyanis and Neichoru, Chicken Peralan is easy to prepare as well. This recipe has been adapted from Mrs. K.M. Mathew, a culinary genius. She was the Chief Editor of Vanitha, a women’s magazine in India and was also the wife of K. M. Mathew, Chief Editor of Malayala Manorama daily. Her name is akin to every Kerala woman and her cookbooks are passed on through generations. I know for sure because my Mom had collected so many of her signature dishes and had gifted the recipe collection to me when I got married. This culinary diva was is famous as she made sure to give the humble-everyday-Kerala dishes its due. 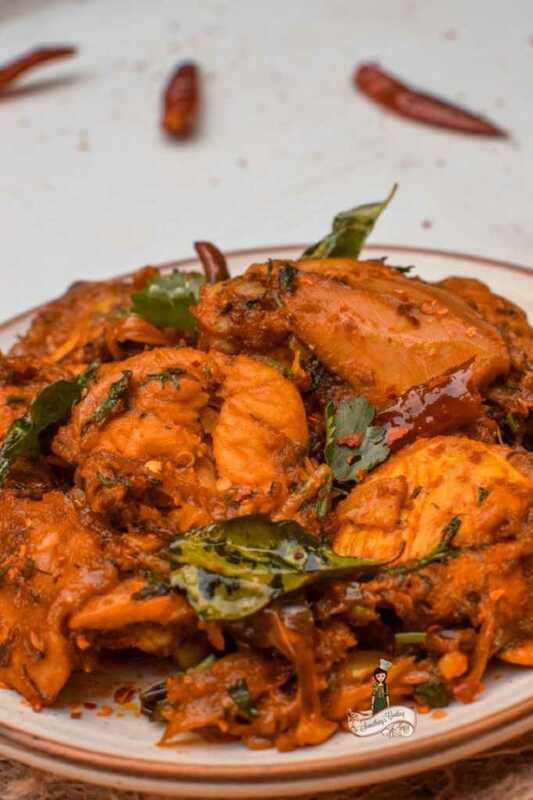 Chicken Peralan has a perfect balance of spices. 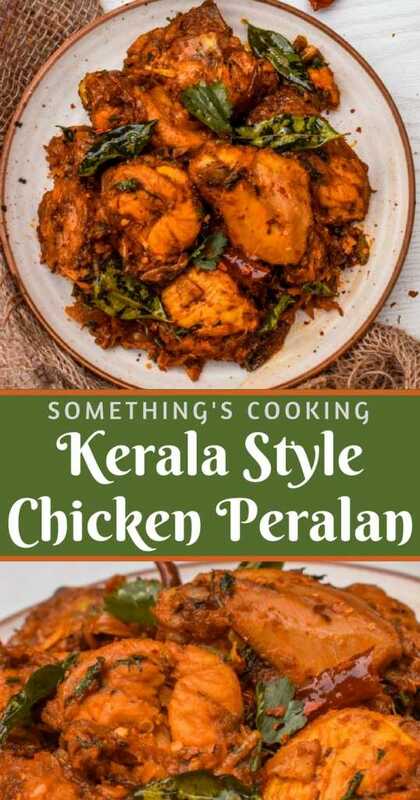 Peralan means ‘coated’ or ‘covered with’ and thus, the marinated chicken pieces are first half-fried in oil and then coated with fried onions to slow cook. During the initial dry roasting, water oozes out from the chicken pieces and it cooks within. No further water is added making the final dish smeared with onion mixture. 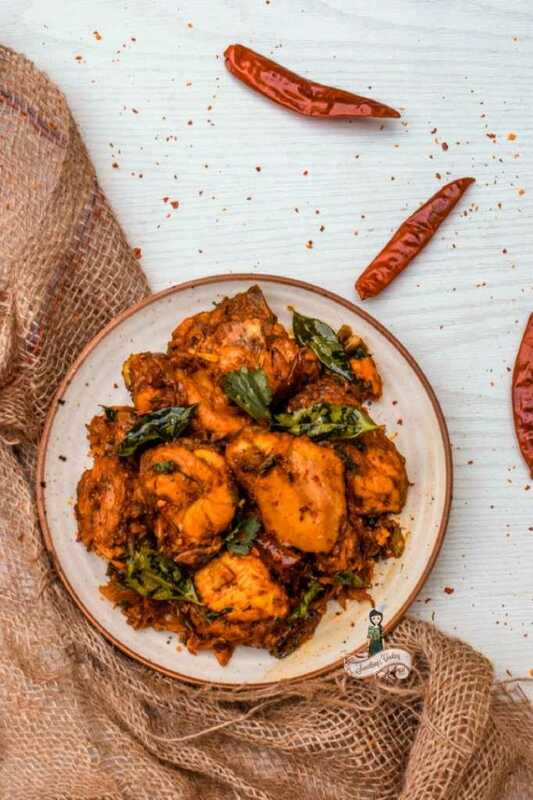 Chicken Peralan is a Kerala style spicy, delicious dish where the chicken is marinated in a rich blend of spices which is then roasted and cooked in fried onions. Grind the ingredients together and marinate the chicken pieces along with the juice of half a lemon for an hour. Heat oil in a pan and add the marinated chicken pieces. Once it is semi-done, remove the chicken pieces in a kitchen towel. To the same oil, add finely chopped onions and Fry. Once done, remove from oil. Mix the semi-fried chicken with fried onions. Add these back to the pan along with curry leaves. Cook for ten more minutes, mixing well in between. Switch off the flame and add a tsp of coconut oil. Let is rest for another ten minutes before serving. I hope you enjoyed this lip-smacking dish! Let’s pledge today to cook and try out our traditional food more often in our homes. Find more food from Kerala cuisine here. This looks like a yum recipe! And the pics are just too good! My mouth is watering!! This looks so tasty!! This one looks simple to make and the ingredients are not to complicated easily there at home always. Thanks for sharing. I’ve rejoiced Kerala foods and their tastes. I’m sure people will love this recipe! Your recipes are tempting and mouthwatering. Though I’m a strict vegetarian, I enjoyed reading this post. Keep cooking. Keep blogging. A mouthwatering dish! I am a chicken lover and going to try this soon. Lovely recipe. Surprisingly not one i think I’ve had a lot, inspite of the Kerala connection.. Your way of explaining the recipe is so easy and the images make it all the more interesting. I love to keep coming back to your site for updates. Aaannnnndddd I’m salivating now! Sending this to mom rightaway! You are right, regional cuisine has it’s own charm. Today when people are moving towards international cuisine, something authentic always hold it’s place in everybody’s heart. Looks delicious, sounds delicious. Your post makes me hungry! Loved it, Shalini. Pretty unique yet simple. Have bookmarked it and will make it soon.